Since a few years ago, in European context, it was difficult to easily summarize habitat aspects directly related to ‘water availability’ in a given river stretch. In order to fill this gap, LRD (Lentic-lotic River Descriptor) was recently developed. LRD allows the characterization of a river reach in terms of lentic-lotic character, that depends on river morphology, sediment transport and deposition and water level. Among the habitat features, lentic-lotic proportion has resulted as one of the most important in defining aquatic invertebrates community structure in Mediterranean area. For LRD calculation information related to presence and variety of flow types, substrates, channel vegetation, bars, artificial structures etc. are considered. About this, INHABIT has demonstrated how a significant portion of the variability observed in reference sites, or in any not significantly altered river stretch, is associated with habitat factors, related in particular to lentic-lotic character and confirming the key role of lentic-lotic character in structuring aquatic invertebrates communities. INHABIT has defined a general model that relates the variability of STAR_ICMi and its component metrics (used for the assessment of the ecological status of rivers based on invertebrates) with the lentic - lotic character. Considering river stretches not affected by water pollution nor by significant hydromorphological alterations and land use, the relationship between STAR_ICMi and LRD - that follows a bell-shaped curve - is significant, with the maximum values of STAR_ICMi obtained at intermediate values of LRD (i.e. not too much lotic nor too lentic). 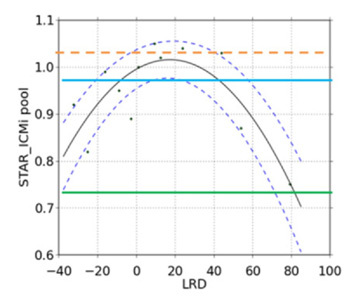 In general, the derived models indicate that the values of the biological metrics are negatively influenced by very lotic or lentic LRD values, and get, instead, optimal values for intermediate values of the LRD. The overall accuracy of classification methods can then be poor when lentic – lotic conditions are far from neutrality. When values greater than LRD 50-60 are recorded, river stretches that do not involve significant anthropogenic disturbance may be misclassified as in good, or even moderate, condition. The same underestimation of ecological status could be achieved when LRD values score <-20 . In very lentic or lotic conditions, when the absence of significant water abstraction is confirmed, it is necessary to provide "refinements" to the expected values, in terms of reference conditions for the STAR_ICMi and its component metrics. Starting from the river type (e.g. for the use of appropriate class limits and the "optimal" value of the metric), it is useful to operate a site – specific refinement, based on the lentic - lotic character observed in the river stretch at the moment of sampling. This can be easily done when the quantification of the lentic - lotic character of the river stretch at the time (or similar periods) of the biological sampling is available. The needed information can be easily obtained by applying the CARAVAGGIO protocol, involving about 3 hours work in total, including field survey, data input and calculation of descriptors. The collected data will allow the estimation of a correction factor for official reference conditions in terms of accuracy, therefore in line with WFD requirements. The application of this correction factor is, in our opinion, essential in the Mediterranean area, in order to limit the underestimation of the ecological status in periods characterized by water scarcity. Along with the general definition of the pattern of response between lentic-lotic character and metrics indicator of the ecological status, INHABIT project has provided examples of reference values actually found in a water body as a function of LRD values estimated on the basis of expected flow. This activity was carried out on selected water bodies in a Mediterranean test area (Sardinia). The study considered two phases. During the first phase a regression model has been developed in order to derive LRD value in a river section from water discharge data. The highly significant model, obtained by a multiple regression analysis, includes the following variables: LnQ (natural logarithm of the water discharge), Substrate (mean value of the substrate converted into numerical code), HQA and TchWidth (total channel width of ). In the second phase we calculated the value of STAR_ICMi expected for these conditions of lentic-lotic character. From such modeled LRD values, derived on the basis of a large series (1922-1992), expected STAR_ICMi values were obtained as a function of the respective LRD values. This activity has clearly highlighted how in all considered water bodies, in all the years, observed flow would determine non-optimal LRD values for benthic biocoenosis; corrections are thus needed for expected reference values. INHABIT project highlighted that the effects of a lack of accuracy on the classification, i.e. if site - specific correction is NOT used, there may be some ≈ 30 % of water bodies in Mediterranean area, whose ecological status will be underestimated. The approach here summarized allows, in many cases, to identify and reduce the occurrence of " false positives", for example, in the relatively frequent cases when the risk analysis does not reveal significant pressures, while the biological judgment indicates obvious deviations from the expected conditions. Detail results for this activity is presented in Deliverable I3d1 (papers I3d1.2, I3d1.3 and I3d1.4, In Italian) e I3d4_EN (in English).